punches | Living "after the manner of happiness"
Tonight I would like to speak on three different topics. They may or may not seem like they are related, but they all are core to our task and privilege of parenting and so they do share some commonality. I will use a slide to illustrate each of my three topics. Now, pretend you’re me. You’ve just asked someone if they prioritize time and energy to nurture their testimony and they answer with “I could do better.” What does that mean? How do you interpret that answer? Of course we can all do better at everything, so it doesn’t really answer the question. It sounds like an answer driven by some sense of guilt, but it’s still ambiguous. On the one hand, a person might do nothing or next-to-nothing to nurture his or her testimony and so “I could do better” is just a gentler way of saying “no,” perhaps without wanting to say so so abruptly. On the other hand, Mormons—and particularly Mormon women, perhaps—are really good at making up reasons to feel guilty when in fact they are doing plenty to nurture their testimony. I bring this up, though, because in too many cases it seems evident after some discussion that we really don’t prioritize the nurturing and development of our own faith and testimonies enough. We are busy Moms and busy Dads and taking time for spirituality is easy to neglect and too many of us are neglecting something that will take its toll on our children. I’m not sure that it’s true that we have to love ourselves before we can love someone else or that we must learn to forgive ourselves before we can forgive other people. The scriptures don’t seem to support those ideas very clearly. But where it comes to nurturing testimony and where we are talking about parenting, I do not believe we can escape the reality that you are going to have to take care of #1, so to speak, if you’re going to be able to help #2 and #3 and… #8. I have on a few occasions encountered a less-active parent who believes their child will benefit from an upbringing in the Church in spite of their own inactivity and so they facilitate getting their kids to Church but do not back that up through their own practices at home or by their own consistent attendance at church. How well does that work?! You can love and forgive a child even while you are in the process of learning about Heavenly Father loving and forgiving you. But the likelihood of your children ending up with deep spiritual roots in the gospel is pretty low when you are not establishing strong roots, yourself. Happiness. We believe that the greatest, most genuine happiness—both ultimately in eternity and immediately in the present—are found through the Savior and in realizing His We learn to see ourselves and others the way He does and we discover our own value and acceptability through Him. The highest form of happiness is only available to those who truly and deeply receive the Savior. And your children are much more likely to nurture a testimony and receive the Savior if you do. Family. We believe that the greatest family unity depends upon family members choosing the Savior and receiving the ordinances and observing the covenants made available to us in temples. This is true in eternity where we believe such marriages and families can live in an exalted unified state. It is also true in a very practical sense right now on the earth. This is painfully illustrated when two church members marry in the temple under the belief that their spouse will maintain beliefs in Church doctrine and maintain a commitment to commandments and covenants—but then one of those two parties changes their mind post-marriage. In such a case, the difficulties in the marriage and family can be staggeringly painful and the family may not survive intact. The promise of strong eternal families is much more likely to be realized for your children if you nurture your own faith and testimony and help them do the same. So faith and testimony are important. For your kids, your example is huge. Your setting a good example, won’t guarantee anything, but it will increase the chances. Whether you set a good example or a poor example in this regard, it will be noticed! Now, how do you nurture your testimony? You speak to God personally through prayer morning and night. You won’t be nurturing anything, though, if you just go through the motions. You pray meaningfully morning and night. You seek out and listen to God’s voice daily through scripture reading and through paying careful attention to the words of modern prophets (of which there are 15 on the earth today, not just one). You make the temple and temple worship part of your life. You do work for the dead and return again and again to learn and to renew covenants. If the ceremony and ritual of the temple are uncomfortable to you, come see to me or one of my counselors and let’s talk about it. You maintain high standards for your consumption of media. How serious do our kids think we are about the gospel if they know we watch inappropriate media. After all, I can still get a temple recommend after watching R-rated movies, so what’s the big deal?! You make family prayer a priority. How serious do our kids think we are when they hear references to family prayer over and over again in church but it doesn’t seem important to their father or mother? You approach modesty as if your body really is sacred and that words of Church leaders matter. How serious do our kids think we are when we wear immodest exercise clothing or swimwear and/or don’t seem very anxious to get back into our garments? You honor the Sabbath in meaningful, noticeable ways. How serious do our kids think we are when our Sabbath consists of three hours of Church followed by hours of football and other things that really have no basis at all in worship? Some will accuse me of over-emphasizing the letter of the law and being Pharisaical with such examples, but here’s the deal: 1) These are exactly the kind of things that strengthen or weaken our children spiritually. And, 2) You are not nurturing your testimony if you are not striving to live the gospel in deep and meaningful ways, including observing practices that invite the spirit. The Savior taught that those who do the will of God find out the truthfulness of his gospel. Those who go primarily just through the surface-level visible motions are far less likely to be increasing in testimony. Brothers and Sisters, for your children’s sake, please place a significant priority on nurturing your own faith and testimony. And do all these things with an attitude of gentleness, love, and affection toward your children that they may know that this is a gospel of love and not come to suspect that it is just a gospel of strict rule-keeping. M ost Mormon children, during their childhood or during their youth or during their adult years, eventually get punched in the mouth. 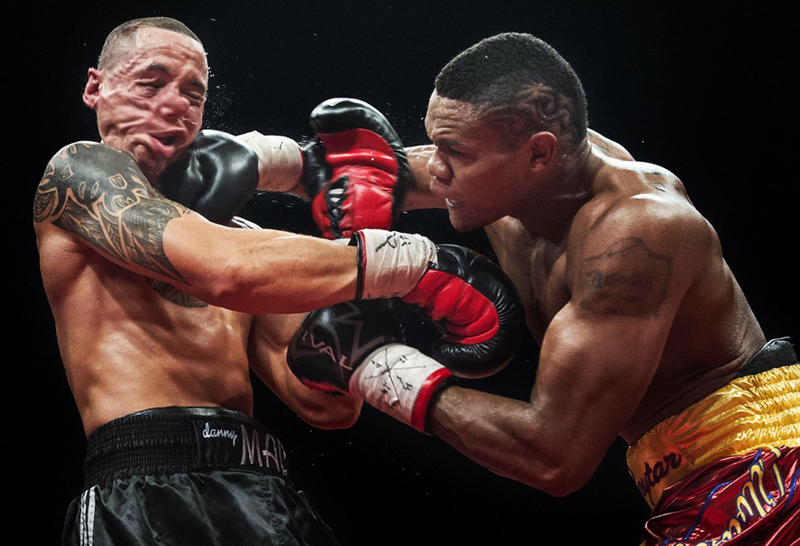 Some seem to get punched extremely hard. Some seem to get punched over and over and over again. Many here in this room probably know what it is like to be punched in the mouth. How do we help our children prepare for this? There is much we can teach them to help them avoid adversity in life and the troubles that will come to them through their own poor decisions. We can teach them to follow the prophet, to keep the commandments, to stand in holy places, to understand agency and consequences. And if we teach them these things and they adhere to them, they will, in fact, avoid a lot of trouble. But it will not exempt them from troubles that come through the poor choices of others or the troubles that are simply inherent in this mortal experience. It will not exempt them from the very purposes of mortality, which include testing and gaining experience with opposition, temptation, and agency, including others’ agency. It may not exempt them from abuse at the hands of others or from tragedy through the fault of no one in particular. Do we teach our children the doctrine of adversity and opposition? What is the doctrine? The doctrine is that, for our own benefit, there must be opposition in all things and that that opposition isn’t pretend or hypothetical—it’s real. The doctrine is that we came here to learn under different and more difficult circumstances than existed in the pre-existence. The doctrine is that a veil exists so that we can make choices and deal with opposition with faith and without a perfect knowledge—and without immediate relief from difficult circumstances every time we ask Heavenly Father to provide the relief we want in the way we want it. Let me mention three specific types of punches to the mouth that we need to be prepared for and that we need to prepare our children for. These three things can overlap each other. First is the broad category of unexpected life-changing challenges, disappointments, and tragedies. This includes things like loss of a loved one; a sudden physical or mental health challenge, loss of a job, birth of a seriously limited child, abandonment from a parent, betrayal of a spouse, divorce, absence of an acceptable marriage offer, inability to have children, etc. You could add other things to that list. Keeping the commandments does not exempt us from difficult things in life—including very painful experiences and tragedies that come to us through no choice of ours. Can bad things happen to good people? Can horrible things happen to good people? Yes. And they do every day. Might they happen to us? Yes. How do we prepare for them? We understand the doctrine of adversity and opposition. We accept that we are not exempt even though we may do many things correctly. We develop faith and testimony. We develop deep, sincere, real humility and submissiveness. We develop a work ethic. We can soften the pain of life’s inherent unfairness by understanding and accepting the doctrine and by recognizing that, while each of us is special, we are not special in the sense of being exempt. Then, when extreme hardship or tragedy comes, we turn to the Lord, we place our submissiveness on the altar and our trust in Him, and then we humbly but resolutely and patiently go to work on whatever it is we need to do or endure. As we know, the Lord is not likely to change or remove even the worst circumstances during the moments that we are on our knees asking Him to change them. What He will do is enable us to work through or around those things—or sometimes to simply endure them—after we plead with Him and then go about doing our best to resolve or handle the difficulty. More easily said than done. But that is what makes such elements of preparation all the more important. We need to teach these principles to our children. We also need to model them. Second is the category that I will refer to as the Absent God. It sometimes comes immediately upon the heals of the types of challenges, disappointments, and tragedies I just listed. In some cases, a person turns to God—perhaps repeatedly—but doesn’t feel like He’s listening and then wonders if He’s even there at all. It can also happen when a person seeks a testimony through a personal spiritual witness but doesn’t feel like that witness has come. In these types of situations, it seems like God is absent. He is not absent. But connecting with Him can seem elusive to the point of generating doubt and disbelief. When you get punched in the mouth and turn to God and do not immediately find Him or evidence of Him, but you expected to, it can feel like you’ve just been punched in the mouth again and are going down for the count. What is the doctrine? The doctrine is that God is our father. And the doctrine is that He wants us to become like Him, which surely means that we eventually become spiritually and in every way self-reliant and capable, just as He is. In order to help us do so, there will be moments where he helps us in obvious ways and there will be many moments where He offers His love and emotional support, but allows us to lean into the wind ourselves. There are simple but profound truths here. A parent cannot help a child become all that the child can become without allowing the child to experience growth through struggle. 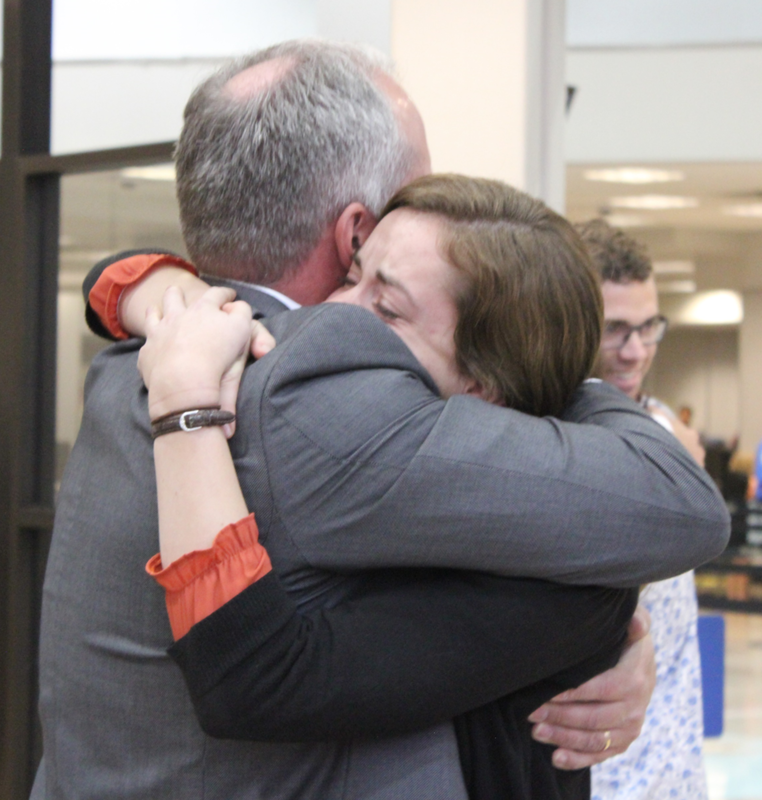 Our daughter, Anne, just went through her first transfer—or six-week period—of her mission in Texas. She was assigned to a trainer who would not or could not work. Her trainer was dealing with depression to the point that she could not bring herself to leave their apartment until very late in the afternoon and so Anne became—or at least felt like—a bit of a prisoner in that apartment. It was very hard for her. She left the MTC excited and was anxious to be a missionary and to learn how to be a missionary. Getting up at 6:30 in the morning and having nothing to do for the next 10 hours but read your scriptures, study Preach My Gospel, and practice Spanish verb conjugations, mostly by herself, was hard. In fact, it was miserable and, perhaps worst of all, she felt a lot of guilt and began feeling very depressed, herself. As her parents, we were very worried about the situation. I knew it was taking a toll on her and I felt very tempted to intervene. I imagined conversations I might have with her mission president. I thought about calling her. Texas isn’t so far away I couldn’t have just gone to see her! Anne would have liked a hug from her Dad and Mom. She would have appreciated a phone call. She probably would like to have exchanged texts and letters every day. Instead she heard from us once or maybe twice each week in a letter or email and she was mostly left to herself to work her way through it. Meanwhile, she was turning to her Father in Heaven, but he didn’t send any angels to help her and things seemed to get worse and worse before they got better. What happened, though, is that Anne turned to the Lord and then went to work on loving her companion and developing patience. To make a long story short, she came to love that companion and she found meaning in their experience together. She grew in ways that those difficult circumstances encouraged. Neither her earthly father nor her Heavenly Father intervened to make the problem go away and at moments were or seemed absent. But these things ended up fostering instead of hindering her growth. Even the Savior, at the most extreme moment in human history, was left by His Father to struggle through something staggeringly enormous on His own. Apparently that was necessary. We must teach our children the purposes of mortality and the meaning of growth and struggle and effort and the ways in which our Father in Heaven will and won’t help us or reveal Himself to us. We must teach our children also about the ways He communicates with us, which occasionally may involve an intense “burning in the bosom” experience, but most often is more quiet and subtle—sometimes to the point of not even being noticed. My third category of being punched in the mouth regards those members of the Church who have not been exposed to criticisms and difficult-to-resolve questions in Church history. And then when they are exposed to them, feel very much punched in the mouth and, in some cases, worse, like they’ve been betrayed by Church leaders they trusted who, they may feel, actually conspired to keep truths from them. For some members, this picture behind me is a fairly accurate representation of how they feel. To make matters much worse, some members in those circumstances become suspicious of who to trust and who not to and they develop fears over the response they’ll receive if they confide their fears and concerns and doubts and questions and mistrust and sense of betrayal in church members they should be able to trust and lean on. So, of course, there are two categories of things we should be doing about this. The first relates to nurturing our own testimonies. Moms and Dads need to understand their own faith and how to approach these issues. It may help to begin with the reality that while the internet can connect you with many disaffected members of the Church, you also have, right here within an arm’s reach, members of the Church who are very familiar with the issues, appreciate the doubts and questions those issues can inspire, and who are yet full of faith and devotion to God and His Church. We are happy to listen and happy to share and we don’t condemn, accuse, or belittle people who have honest questions. And you will find us reasonably capable both of us using our brains objectively and approaching spiritual matters spiritually. Some people feel that the Church’s approach to helping members build faith and testimony has amounted to a betrayal because the Church has not made an open discussion or even rebuttal to these issues part of Church curriculum or Sacrament Meeting talks. Similarly, our children may lose confidence in their parents where they think their parents are unwilling or unable to address a faith-based approach to the issues. My suggestions tonight are that 1) you become comfortable with your own testimony, 2) that you do so with some familiarity with the issues your children will surely encounter and question in the digital age, and 3) you teach your children a faith-based, thoughtful and honest approach toward spirituality and toward evidence and unknowns. A couple of years ago, the Church was about to release its essay on Joseph Smith’s polygamy. 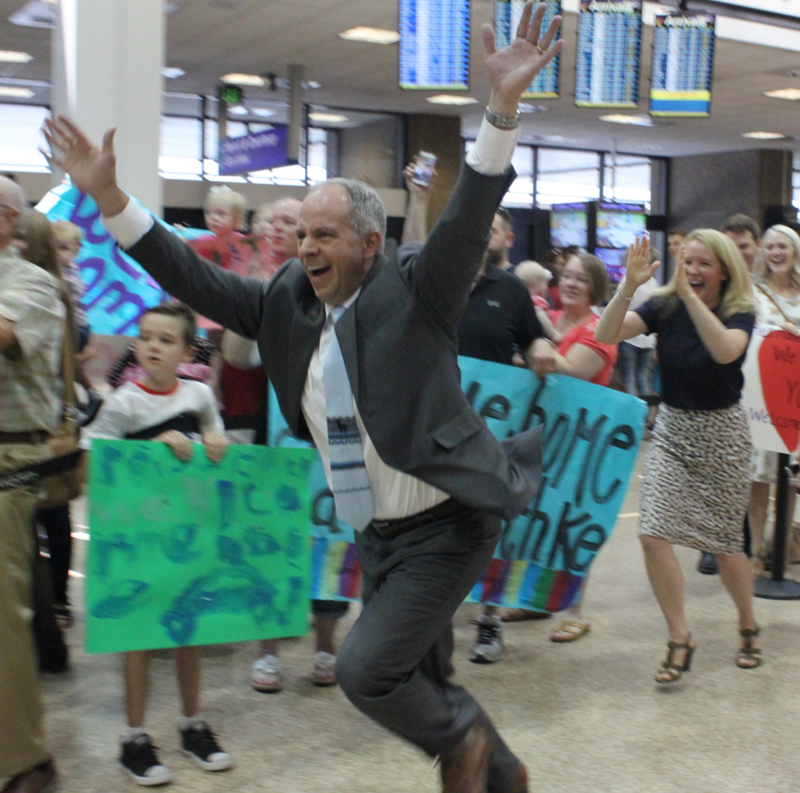 While our family culture has always invited awareness and questions and I have talked to my kids about various critical topics and they certainly have known that Joseph Smith was a polygamist, I had never spoken with them in any detail about Joseph Smith’s polygamy and about the particularly difficult-to-understand aspects of it. I knew, though, that I wanted them to hear about that from me before they heard about it from someone else and began to feel critical of either my “ignorant faith” or of my “withholding information.” So I gathered them together and we talked about it. I invite you to understand faith, agency, testimony, evidence, and unknowns and to teach the related principles to your children. By the way, don’t raise your kids in an overly black-and-white environment. Not all doctrine is settled; answers to both historical and present questions of “why” are often not readily available; people’s motives are not always known; and faith, by definition, includes uncertainty. There must be opposition in all things. Agency matters. All these things indicate that while God will give us spiritual helps (confirmations, etc. ), he is still asking us to live by faith including with matters of uncertainty and things that are not entirely known. 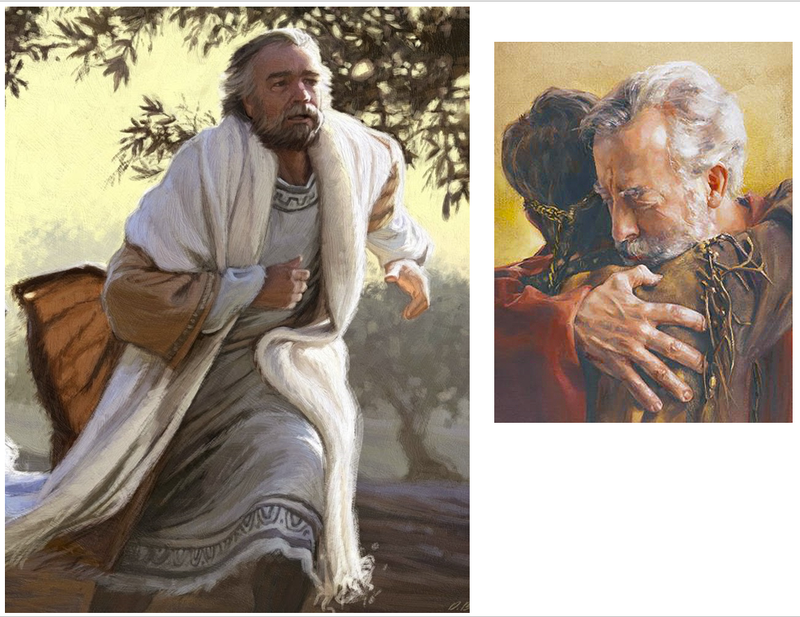 …both of which focus on the father of the prodigal son. I am particularly fond of the picture on the left. I think that artist captured very well in the father’s face the anxiousness and concern and focus of a father who loves his son and yearns mightily for his happiness. I have long believed that the whole point of the Savior telling that story was to teach us not about the son but about the father because he is a representation of Heavenly Father. We note from this story that the father respected the son’s agency, that he watched for him, and that, at the first sign of his son’s willingness to accept him, the father closed the gap between himself and his son and embraced him. I wish to emphasize one point. We must not condition our children to believe that God’s love for them and His acceptance of them is conditioned upon their performance. On the contrary, we must help them be receptive to the idea that at their very worst moments of life, including moments of extreme personal shame, embarrassment, and disappointment, their Father in Heaven will love them and accept them in His arms. We will do this by their seeing this type of treatment from us. When our children do poorly, which, of course, we have all done, whether it is by mistake, poor judgment, or outright rebelliousness, at these moments we need to withhold criticism or any kind of “I told you so!” or “Why didn’t you just listen to me?” or “See! That’s what I’m talking about!” or “Didn’t I warn you?” or all those kinds of things. Instead, they need to find us at their worst moments receptive to them, patient and understanding and empathetic. When we hug our children and lavish praise on them after they do well and then we distance ourselves from them, perhaps by sending them to their rooms, or stopping talking to them or withholding affection from them when they have done poorly in our eyes, then we are conditioning them to believe that this is how God is, which isn’t true. At each of our worst moments in life we need the Lord and we need the support of those who love us and whom we should be able to trust to have patience with us. Let us help our children to find safety in us at those tough times just as each of us can find safety in our Heavenly Father and in the Savior at our worst times. By the way, I believe I can say with complete confidence that there are nine bishops in this stake [now 10] along with myself and my counselors who you can trust to be supportive of you and not judgmental and condemning when you have erred. All of us are familiar with our own shortcomings and errors. Make a priority of nurturing your own faith and testimony. Teach your children how to prepare for and handle adversity. Help your children discover that your love is not conditioned upon their earning it. Brothers and Sisters, we have the true gospel. We don’t know everything, but we know the critical things. We do know the path to happiness and peace and wholeness. Parenting is a sacred privilege and it is one of the great schools of mortality. It is certainly tough. We do have a Father in Heaven. He will help us in our inadequacies. He will help us work on or around our shortcomings. He will be with us and magnify our efforts. He loves and cares about your children—His children—with a perfect love and enjoys a perspective of seeing the end and not just the present. The fact that He knows how this ends and is happy must surely tell us something. God bless you. You are wonderful. Whether listening to Becky and me tonight was worthwhile, your coming speaks very highly of your interest in being a great parent. May the Lord bless you and may you increasingly feel his presence in your life. In the name of Jesus Christ, amen.